Island hostels offer the perfect getaway on a budget, and HI Hostels has a selection of hostels on islands around the world. Whether you want to sun yourself on a remote island hostel in Australia or enjoy the tranquility of Scandinavian island life, our hostels offer affordable, clean and friendly accommodation with the assurances of HI’s quality standards. To whet your appetite, here’s a selection of our favourite island hostels. Remember, if you don’t see something you like here, you can always check out our 4,000 other hostels through our Hostel Finder. Located within Kenting National Park on the southern shores of the island of Taiwan, this hostel is nestled by the sea and offers outstanding views of the crystal blue waters. Built by one of Taiwan’s most famous architects, this YAC hostel offers you the chance to stay in a classical Fujian-style building with sandy beaches, botanical gardens and wooded nature walks at your doorstep. Situated on the southwest coast of the Thai-Malay peninsula, HI Krabi combines idyllic beaches with the convenience of a town centre location, offering the best of both worlds. Against a majestic mountain backdrop you can sip drinks on one of the hostel’s private balconies, or hop on a quick ferry to the nearby Phi Phi islands for snorkelling along the reef or sunbathing on the pristine tropical beaches. With its own private beach on the east cost of the Thai-Malay peninsula, this hostel is ideal for escaping the crowds and relaxing in the sun. With a poolside bar and a range of activities available – including snorkelling on nearby islands, beach volleyball, fishing and visits to nearby temples – HI Ban Kruit is a great choice for all types of island getaways. If you’re lucky, you just might see some of the native penguins relaxing in the gardens at YHA Kangaroo Island. Overlooking a beautiful bay on the eastern coast of Kangaroo Island, this hostel offers light, airy rooms, sea views and a convenient 2-minute walk to the ferry to Adelaide. The nearby golf course and Baudin Conservation Area are yours for exploring if you fancy a change from the beautiful beach. The HI hostel at Bungalow Bay boasts a true island resort atmosphere: breezy hammocks by the pool, individual A-frame bungalows and a lively bar with funky nightlife nestled in over 6 acres of tropical surroundings. There is also an on-site wildlife sanctuary where you can interact with Australian wildlife like koalas and crocodiles. With 42 beaches accessible from the island, it’s no wonder Florianópolis is popular with surfers and sun-seekers. 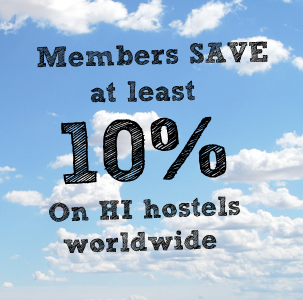 The HI Hostel on Ilha de Santa Catarina is well-placed and offers small rooms for 2-6 people. Famous for great cuisine, and offering a balance between bustling city life and quiet fishing villages, Florianopolis has been voted the ‘best place to live’ in Brazil. Located on the Isla del Sol (island of sun) in Lake Titicaca, Hostel Inca Pacha is an eco hostel offering stunning views of the lake and surrounding mountains. This HI hostel is perfectly placed for trips to the nearby Inca Temple of the Sun, Island of the Moon, or even for exploring the town of Copacabana, which is accessible by ferry from the island. Suomenlinna Island is just 15 minutes from the lively Helsinki city center by ferry, but feels a lifetime away. The hostel is in a 250-year old fortress and is a UNESCO World Heritage site. In the summertime you can explore the other surrounding islands by ferry, or enjoy the mature trees and peaceful setting year-round. Veli Losinj is a beautiful historic town on the Croatian island of Losinj, in the Adriatic Sea. Once a fishing port, the town is now popular with tourists seeking relaxation and escape from the chaos of modern life. The HI Hostel at Veli Losinj is a quaint old villa, located just steps away from the port and baroque church of St Anton. 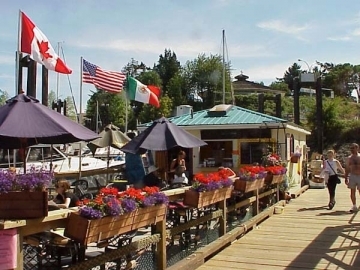 Located in the trendy waterfront / arts district, this hostel sits right in the heart of downtown Nanaimo’s cafes, bars, galleries, and local points of interest. There’s also a variety of outdoor activities available on the island, and this highly-rated hostel is perfectly placed for experiencing Canada’s natural beauty – or just sitting by the hostel’s cozy fireplace. With whale-watching, hiking, sailing and kayaking available on Cape Breton Island, this hostel is perfect for nature and adventure-lovers. The hostel is situated on Salt Mountain with a view of the Bras D’or Lakes, and provides easy access to nearby National Parks and beaches, as well as offering excellent guest facilities such as free internet and private rooms.